As you might have guessed from the clue-laden title, I received a Kindle yesterday! Celebrations! (It being my birthday and all). Those of you who've been reading Drying Ink for a while probably know I'm not a huge proponent of ebooks: there's a tactile something to owning a physical book, having it on your bookshelf and lending it around. And I don't think ebooks will ever be able to replace that. (Similarly, I still love to acquire older books). So, despite that, why do I enjoy having my new toy Kindle? In a word, pragmatism. Having an ebook reader means I no longer need to break my back (and possibly the aircraft) by carrying along my Neal Stephenson tomes on holiday. Believe me, I need to take a lot of novels with me, and having one slim Kindle instead of a suitcase of doorstoppers makes it a lot easier. And less hazardous! I am also - you may have noticed - a book reviewer. This being the second reason: a Kindle allows me quicker access to a lot of titles. Though I'll always prefer physical copies, the digital is just easier - though perhaps not as fun. Now, let's talk about rapidity. Rapidly. I have been called the bane of librarians for my knack of coming into a library to pick up eighteen doorstoppers (the reservation limit) on order. And there's no bookshop terribly close to where I live. So the Kindle represents an immediate solution: either grab a library ebook (which should be available soon(TM), we're promised) or just shop online for a title I'm not certain about buying in print. Will I ever prefer ebooks to print? No - at least not unless I develop some kind of alter-ego. But ebooks, the e-ink of which does not kill your eyes like a backlit screen, are useful - and that, people, is why I'll be carrying around an ereader from now. So, what do you think? 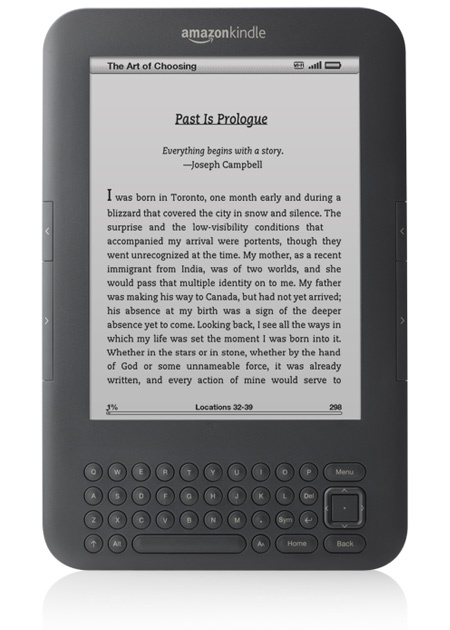 Have you got an ereader, plan to get one... or just hate the thought entirely? Comment and tell me below! I love to collect books, so for me this is a no-buy... Don't get me wrong, I'm super tempted. I deploy to Afghanistan soon and I totally have a spare bag dedicated to my doorstopers, but still I can't budge on this one!